What a nightmare scenario: Five loaves, two fish–and five thousand hungry people! But trust the Lord to turn every event organizer’s worst nightmare into an unforgettable affair! 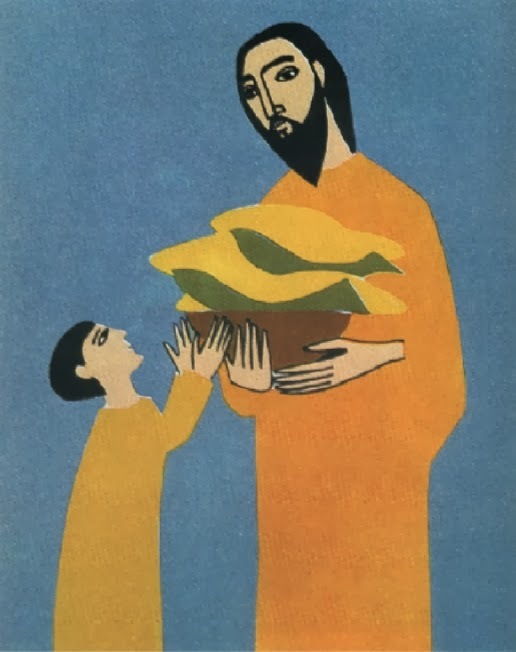 What struck me most this time around, however, was not what happens during the miracle, but after it: As the people sit on the grass after feasting on the miraculous banquet, Jesus tells his disciples to gather the fragments. Hearing him, they probably once again only shake their heads in bewilderment, but just the same they do it as usual anyway. And to their astonishment, the leftover food fills twelve wicker of baskets. Now I have no idea exactly how much that is, but it sounds like a lot. Once again Jesus outdoes himself. Not content with feeding the five thousand, he sends them home carrying doggy bags too. Every moment of our lives, the Lord feeds us with bread, with breath! But what do we do? We eat and run. Today the Lord says to us: Don’t eat and run. Gather the fragments. Linger after the miracles. Don’t rush away. Savor the memory of blessings past. There are still far too many leftover graces that we can keep in storage–crumbs from past miracles can still fill us for days! And every crumb is precious. May we slow down and pause and gather every crumb of God’s graces.